Here is something new from Daddy & Co., which makes for a great addition to any baby gift box or daily need! 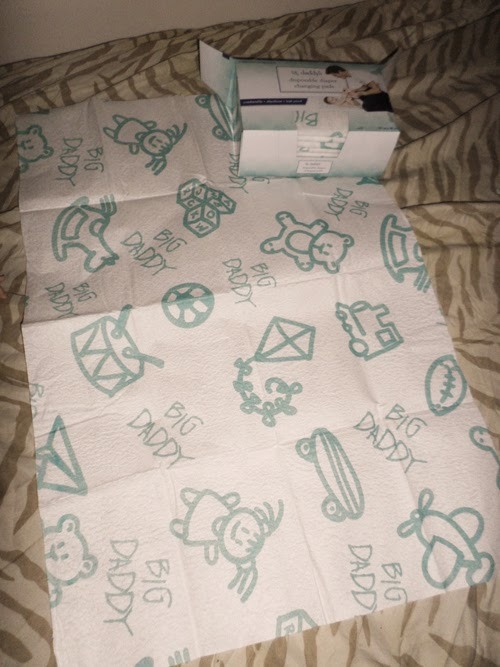 This is box full of disposable diaper changing pads that you can pull out, lay down, use and discard of any time, anywhere without having to put your baby down on a surface that may not be so desirable! These pads are easy to dispense and use and come with a cute pattern to make for a nice backdrop as you interact with your child! As you can see, my son didn't mind these pads at all and was quite happen to demonstrate them for you in his usual manner! A box of 10 pads is $7.95 and will give dad (or mom) the confidence to travel light but travel prepared with these absorbent pads for a clean, on-the-go change as and when baby needs it! To find out more about these convenient products, just head on over to the Daddy & Co. website, which you can find HERE or check them out on Twitter and Facebook! Alternatively, if you would like to WIN a box of disposable diaper pads then why not enter via the rafflecopter below! One winner will be chosen from random within 24 hours of giveaway end! End date for the giveaway is 04/14/14 and the winner will have 48 hours to respond to the winning email before their win becomes forfeit and we have to pick another winner so please use a current, valid email for all entries. Daddy & Co. is responsible for prize fulfillment and shipping! 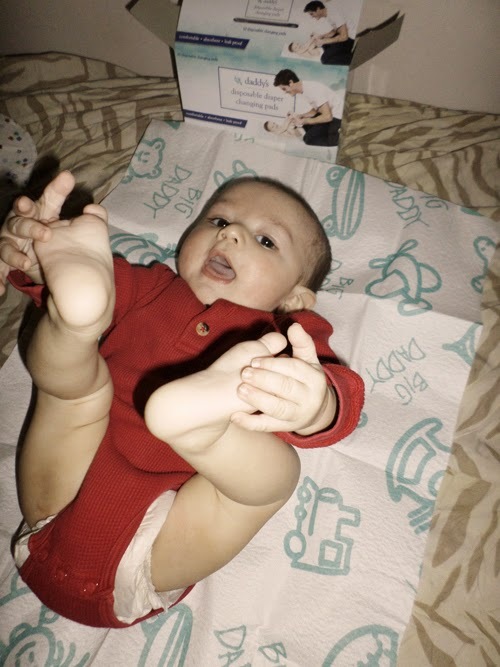 Disclaimer: I was given a box of disposable diaper pads in order to write this review. All opinions are my own thank you! I am sure my nephew could use these for his newborn baby girl. This would be great to win; I'm having my first baby!